Ashlar is dressed stone work of any type of stone. Ashlar blocks are large rectangular blocks of masonry sculpted to have square edges and even faces. 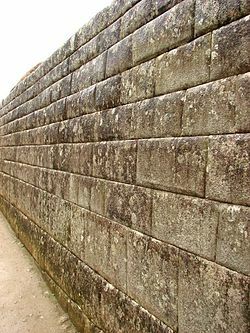 The blocks are generally 13 to 15 inches in height. When smaller than 11 inches, they are usually called “small ashlar”. Ashlars have symbolic meaning for Freemasons and those in masonic schools used as a metaphor for states of progress. In Freemasonry, the ashlar comes in two forms: the rough ashlar represents a rough, unprepared or undressed stone, and is an allegory of the uninitiated Freemason prior to his discovering enlightenment; the smooth ashlar represents the dressed stone as used by the experienced stonemason, and is an allegory of the Freemason who, through education and diligence, has achieved enlightenment and who lives an upstanding life. The term is frequently used to describe the dressed stone work of prehistoric Greece and Crete, although the dressed blocks are usually much larger than the 13 to 15 inches mentioned above. For example, the tholos tombs of Bronze Age Mycenae use ashlar masonry in the construction of the so-called “bee-hive” dome. This dome consists of finely cut ashlar blocks that decrease in size and terminate in a central “capstone”.These domes are not true domes, but are constructed using the Corbel arch. Ashlar masonry is also heavily used in the construction of palace facades on Crete, including Knossos and Phaistos. These constructions date to the MM III-LM Ib period, ca. 1700-1450 BCE.